Today, Tex Co Co is a city northeast of Mexico City, but imagine for a moment that it was once home to a significant Aztec civilisation situated on the shores of what was once a lake. Leander Gaming has jumped on this bit of Aztec history and combined it with the Artefact Feature, bonus game and respins to unlock an adventure that may lead to gold prizes of x500 total bet! Amidst the green, wind-swept jungle and jutting rocks of Tex Co Co, temples used by the Aztecs for prayer and offerings, tower in the background. Aside from the pleasant distraction of intermittent animation around the wheels, you will find a beautiful blonde explorer, Range Rover and turtle that form the higher-value symbols residing on the reels. The symbols mentioned above are followed by three colourful animal carvings and finally the A, K, Q and J at the bottom of the pay table. Instrumental music, heavy on wind instruments and drum beats adds to the mood as do additional audio effects of nature that include thunder, birds and other creatures. If you’re lucky, a precious artefact symbol may appear on the third reel with the power to swap positions with an alternative symbol, the scope of which is to create a payline win or improve an existing one. Keep an eye out for the bonus scatter symbol that can turn up on the middle three reels, in sets of three, to unlock the bonus game. In this feature, you must choose amongst the nine stones until you uncover two identical coloured treasures to collect a prize ranging from x10 to x40 total bet, or a golden treasure to receive a super prize of between x70 and x150 total bet. Peeking out from the right side of the reels is a totem pole, whose significance you don’t appreciate until three or more totem scatters appear on the reels to trigger the respins. These scatters are transformed into one of three random colours: red, purple or orange. The green totem can turn into any random symbol except the blonde explorer. The purple totem is wild with the ability to substitute for any symbol, except the blonde explorer, and embedded with a growing multiplier which can reach x3, x5 or x7 with 20, 30 or 40 lines respectively. Finally, the orange totem appears on the reels by 2, 4 or 6 stacked symbols at 20, 30 or 40 lines respectively, and is a wild that substitutes for any symbol except the blonde explorer. Tex Co Co slot has an RTP of 95.98% and can be played with a range of wagers that start at 40 coins and goes to 40,000 coins. The game played on a 5-reels and 40 fixed paylines, is optimised for mobile, tablet and desktop. If you’re on the go, then you may play the game using a wifi connection on your Android or iOS device. 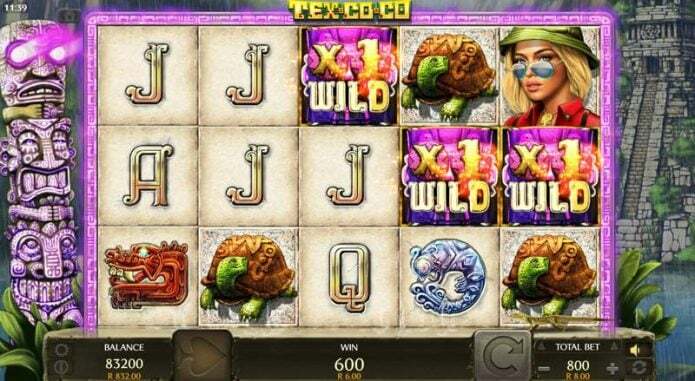 Tec Co Co is an innovative new slot game and definitely worth a try.